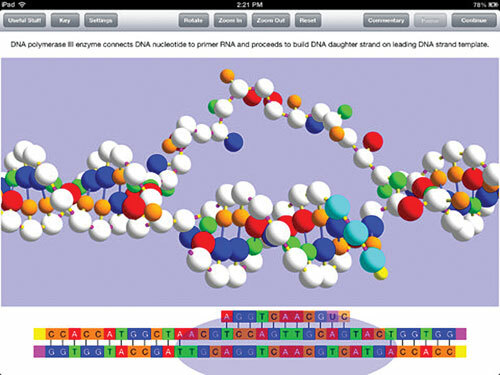 As illustrated with OnScreen Gene Transcription in our May 1 column, OnScreen Science now has a few very nice iPad apps to teach students about DNA and RNA. The OnScreen DNA Model app was the original; as such, it offers students a strong introduction into the structure of DNA. App users interact with a beautifully rendered 3D model of DNA—rotating it, zooming in and out—as they read about base pairing, strand polarity, and major and minor grooves. The 3D model can be viewed as a simple model with artificially straight bonds, or with the more realistic tilted bonds. Students can also toggle between left-handed and right-handed modes to get a sense for helix handedness. Finally, the app contains a very useful denature/renature animation that offers an intuitive sense of how the two strands of DNA actually interact with one another.